Posted on June 24, 2016 at 11:22 am. Portable air conditioners are a handy item to own to get you through the hot summer months. PAC’s or spot coolers as they can be called are nothing new, but have been increasing in popularity because they are compact, versatile, convenient and very cost effective. Depending on what model you choose, PAC’s are quite inexpensive. Models range from $150 to $400. 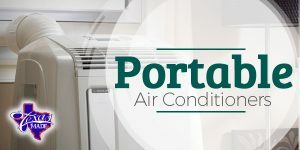 If you are renting an apartment or small house that doesn’t have an A/C you can buy a cheaper PAC as opposed to a window unit and take it with you when you move out. Obviously no installation is required so you don’t have to worry about dismantling it when you leave. It is a permanent purchase that you can take with you and keep enjoying. Most PAC’s are set on a platform with wheels so it can be moved from room to room with you, they are also quite light and can be carried if need be. If you get hot cooking dinner in the kitchen you can simply wheel in your PAC, if you like sleeping in a cool room, set it up in your bedroom at night. The possibilities are endless. When compared to a window unit or HVAC system, a PAC is very inexpensive to operate. They are energy efficient and will keep your power bill low. Another bonus is that a PAC operates as a dehumidifier as well as an AC. It will keep indoor humidity levels low which is great news for an allergy sufferer because it will help alleviate dust mites and mold growth. Some PAC’s have high efficiency air filters built in acting like an air purifier. The majority of models come with a remote control for added convenience.